The initial reaction I get when I'm visiting out of state is how lucky I am to live in California... Lucky? I guess. Sure, I live in a place where I can soak my feet at the beach and simultaneously look up at the mountains and see snow. And the Kardashians live about 20 minutes away from Accessory Genie headquarters. And we don't have to deal with hurricanes or tornados. Okay, I guess you could say that California is a pretty cool place to call home. But when it comes to natural disasters, I personally wouldn't consider dealing with unpredictable earthquakes a plus to living in California. Sure we all take certain measures to prepare as much as possible. But when the earth underneath your feet starts shaking uncontrollably and with no fair warning, it's not exactly a good time. As uncomfortable as it may be, us Californians think it's a small price to pay for living in such a great place. So to prepare ourselves as much as we can for the unpredictable and inevitable, we have emergency preparedness kits to use in the event of a strong earthquake. My emergency kit is pretty basic. But from personal experience, sometimes the most basic items are the most useful after an earthquake. For starters, I have a pair of running shoes unlaced and ready to be put on. Walking around barefoot (if I'm at home) or in heels (when I'm at work) post-earthquake is never a smart idea because of all the debris that is most likely all over the floor. A first aid kit is an essential I had to include in my emergency kit. Mine is small and simple, with only the essentials, like gauzes, athletic tape, bandages, antibiotic cream, etc. Of course, in case of an emergency, I prefer to be able to stay in contact with friends and family, which can be an obstacle when the power is out. My Solar ReStore comes especially in handy for this, as I can charge my cell phone without having to plug it into a power outlet. 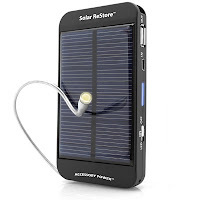 I simply plug my phone into the Solar ReStore, and it automatically charges it using power from the internal battery. When the Solar ReStore's battery is running low, I expose it to the sun, allowing it to charge using solar energy. 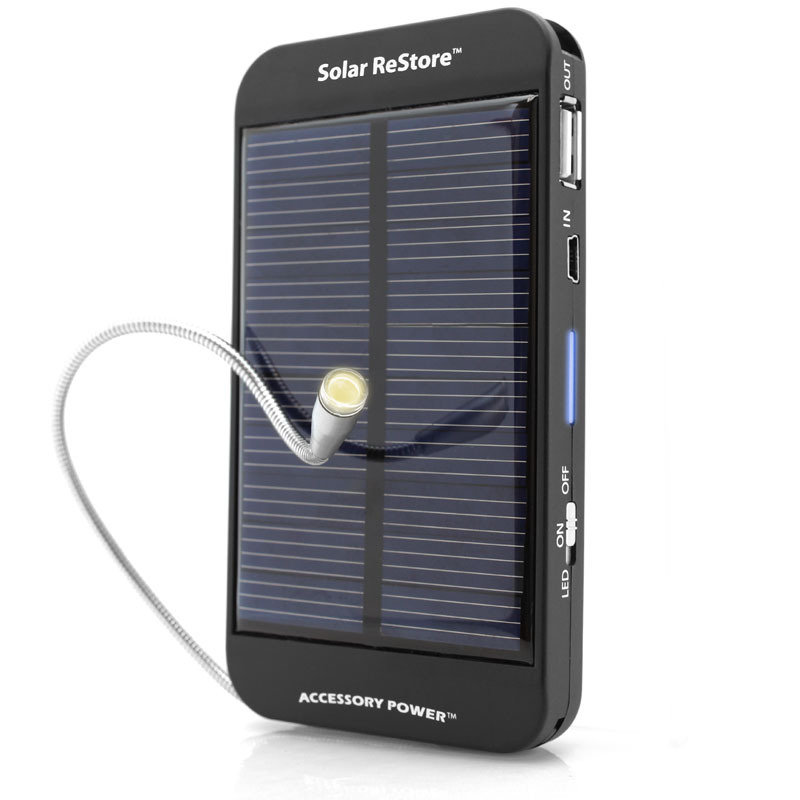 In addition, the Solar ReStore also works as my emergency flashlight, having a side-loaded flexible LED light. In addition to these supplies, I also maintain a bag of canned food and water, checking my supply twice a year to throw out anything that is old or expired and replacing it with new cans. By keeping an emergency kit, I can feel slightly more at ease about earthquakes. I strongly encourage people who live in other parts of the country and suffer from other natural disasters to maintain their own emergency kits. You never know when an earthquake will hit the east coast, or when a tornado will touch down on the west.